You know I love rennovating and DIY and craft and all that ‘get in there and get your hands dirty’ stuff. And that I dream of a beautiful home full of light and old stuff and character. Only problem is I’ve come to realise that the kind of home I want is forever out of my reach. Not cause I can’t afford it. I can’t. There was never any doubt about that. But I’m the queen of finding a way, copying, making do and faking it. So I theoretically could have the house of my dreams. But reality is, it’ll never happen. Not while I live with dogs. And DJ (my new nickname for my partner). The dream: You’d walk onto a welcoming porch, with lots of plants, a cosy daybed, wicker furniture, a place to relax and read, a place to sit and sip ice tea with friends in summer. Reality: the dogs would sleep on the bed, footprints, mud, dirt, maybe even a buried bone under the cushions. I’d come home to find the guts of the cushions scattered like snow all over the yard. Reality: I will paint the walls white and I already have black and white tile vinyl on the floor… Or it was once black and white. Now its black and mud coloured. What on earth was I thinking? And I don’t think we’ll ever have enough room for all the boots, shoes and coats. Imelda has nothing on DJ and his cowboy boot collection. The dream: The kitchen would be light, white on white, open shelves with white and cream crockery, white timber cabinets, a solid timber benchtop, a white farmhouse sink, black and white tiles on the floor or painted white floorboards. Reality: There’d be fingerprints on all the cabinets, the sink would be full of unwashed dishes (that blame rests solely on me), dog hair would float up onto the open shelves and visitors would find bits of fluff on their dinner plate and in their coffee cup (thanks Barney and Mischa. At least poodles don’t shed). The floor would have muddy paw prints and muddy boot prints, even if I mopped every 10 minutes. And I’d be a slave to dusting the top shelves, which I’d never do often enough. The dream: The bedroom would have light walls, timber floorboards, white distressed furniture, white bedding with lace details, old timber, a touch of other colours here and there. We’d have lie-ins and have coffee in bed on weekend mornings. Reality: DJ, the most accident prone man I know, who never saw a pointy stick he didn’t poke himself with and white bedding? Forget about it. The dream: The living room would have a combination of old and new furniture, white painted floorboards, jute rugs, or pale persian rugs. A chandelier, big windows, rich curtains, and interesting items scattered around the room. Reality: Couches without throws? White furniture? 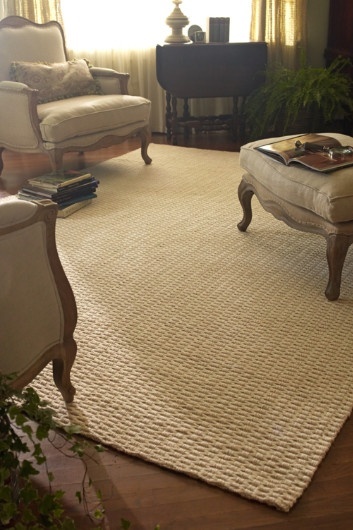 Pale rugs? White floors? Are you kidding? With the mud we have around the farm I think a brown theme is my only option. 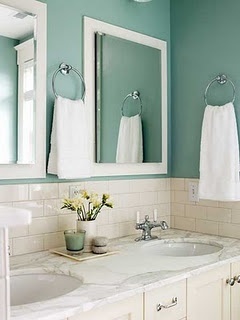 The dream: The bathroom would be white and a pale blue or aqua. My towels would all be white. Reality: When men wash all the dirt off their hands, and rinse it all off before they wipe them on the hand towel, that’s when I’ll get white towels. I’ll continue to work towards my dream home, but I’m realistic. I don’t live in town, we have mud outside our front door at least 4 months of the year. I share my home with animals (and I don’t mean Wayne!) so I can’t expect it to be perfect all the time. Scattered toys and pawprints are the price I pay to share my life with my pets – and I wouldn’t have it any other way. So, my floors will probably never be white. Timber floors with colourful rugs to hide pawprints. My furniture will always have throws over it. My bedding will be dark. My towels will probably be blue or grey. But my home will be full of things I love. I feel your pain! With my 2 furbabies (and messy Hubs)I have sheets over everything and the next minute after I dust, dog hair comes floating everywhere! I wouldn't change my house either–I'm even starting to rethink my white baseboards!!! !